Thanksgiving Day: K-12 TLC Guide. Plymouth, Massachusetts Official Web Site. 12/23/1620: Construction Begins on Plymouth Colony, History Channel. 12/13/1621: The Ship Fortune Sets Sail from Plymouth Laden with Goods for England, Massachusetts Foundation for the Humanities. Forefathers' Day: K-12 TLC Guide. The Plymouth Colony Archive Project, University of Virginia. The Waterway That Brought the Pilgrims to Plymouth. The Society of Mayflower Descendants in the Commonwealth of Pennsylvania. Of Plymouth Plantation, Fordham University. The Mayflower Compact: K-12 TLC Guide. 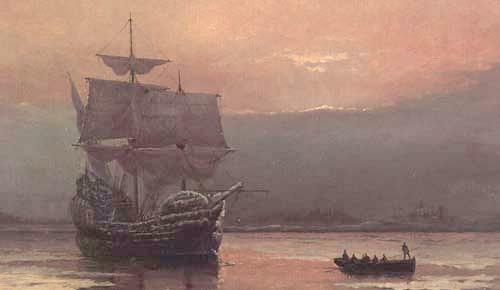 09/21/1620: The Mayflower Departs Plymouth, England. 12/18/1620: Landing Party Goes Ashore Seeking Good Site for Settlement. A List of Mayflower Passengers, 1620. Passengers on the Mayflower: Ages & Occupations, Origins & Connections. Mayflower Lesson Plan (Grade 8), Joseph Ambrovcik, AskERIC.